This past weekend, we set aside some time to commemorate the day our nation adopted the Declaration of Independence and asserted our freedom from the Kingdom of Great Britain. Equal parts revelry and reverence, the Fourth of July is a day for celebrating American ideals of equality, opportunity, and liberty. If and how you celebrated are entirely up to you, though tradition suggests parades, picnics, and fireworks as tried and true. 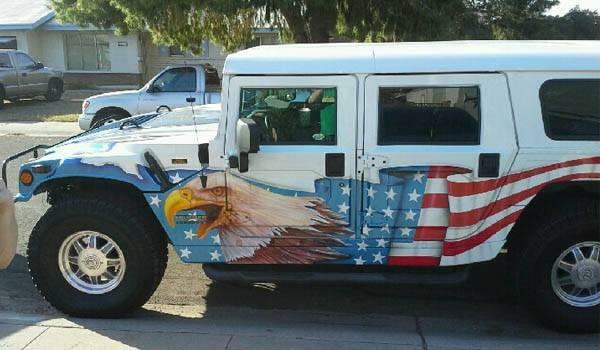 What better way to adorn America’s toughest civilian truck than with the face of Planet Earth’s fiercest avian? You can practically hear this bald eagle’s war cry. Though it’s been almost 60 years since the Hudson Motor Company rolled its final car, this Terraplane remains a classic beauty. 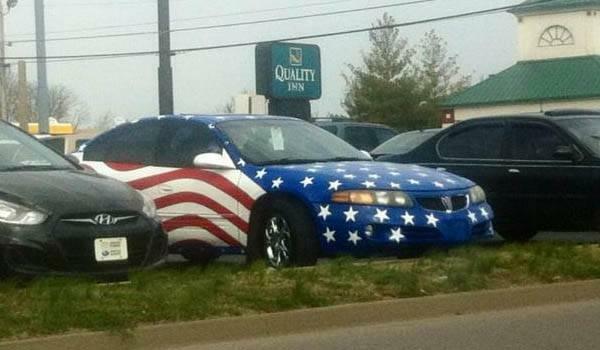 Add on some flame-cut rims and an Old Glory wrap, and you’ve got the perfect symbol for the Golden Age of American auto manufacturing. 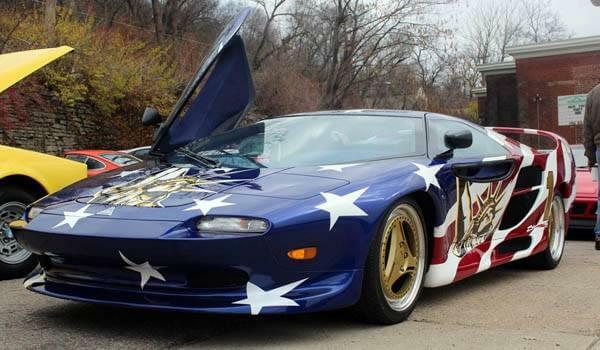 Vector may have only produced cars for a few years, but the patriotic paint on this rare stars-and-stripes supercar will withstand the test of time. 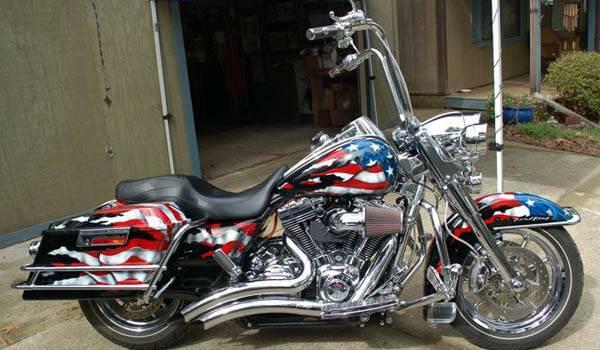 There’s nothing like the freedom of the USA’s open roads, and, frankly, there’s no better way to explore our expansive nation than by riding from sea to shining sea on a custom American Flag chopper. There’s no arguing that Chevy’s Corvette is an icon among American cars. This classic is made even better by the Star Spangled Banner’s gentle ripple. 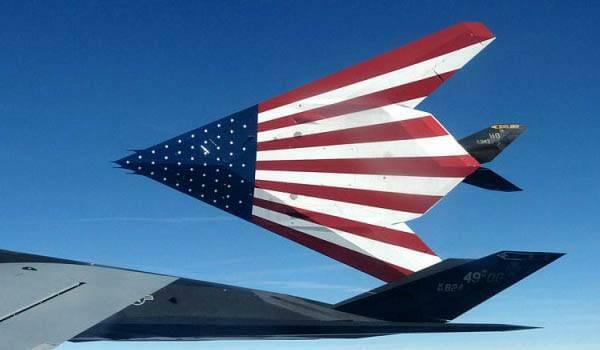 The US flag is not reserved for big trucks and sports cars. 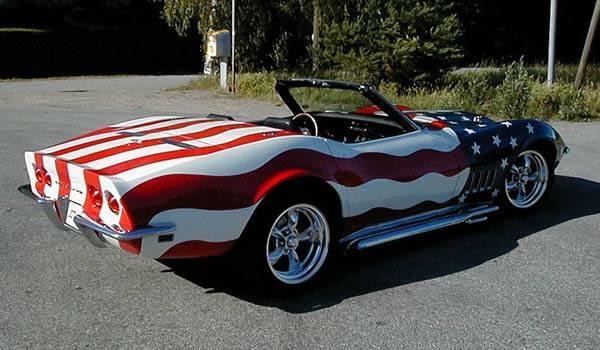 Old Glory is for all people, just as it is for all makes and models. Praise the painter that hath made and preserved this Pontiac Bonneville. 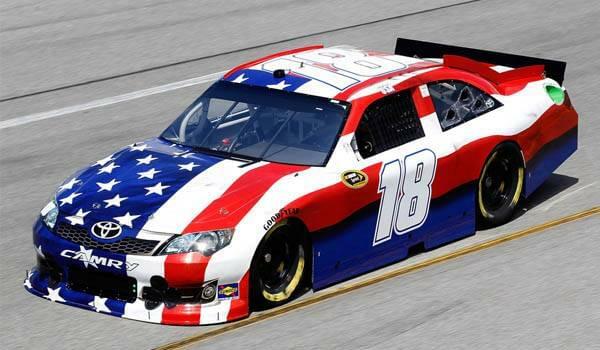 On the eve of the 10th anniversary of the 9/11 attacks, Kyle Busch drove a nearly sponsor-free version of his #18 stock car at the Richmond International Raceway. This car’s scheme was unique in NASCAR, as Busch and his sponsors removed or minimized their usual labels as not to obscure the memorial purpose. 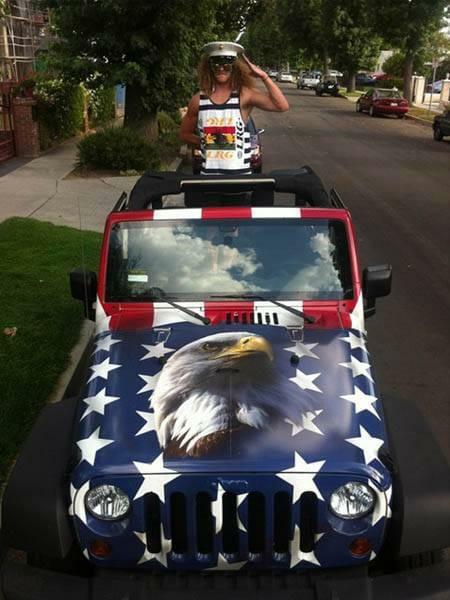 Whether or not you’re a fan of comedian Blake Anderson, you have to admit that the bald eagle’s watchful gaze makes an excellent complement to the All-American Jeep Wrangler. Tesla claims electric cars are the future of American auto industry. 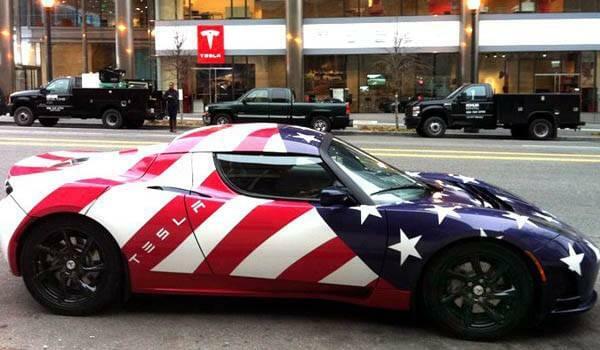 We think this paint scheme should be the future of all Tesla vehicles. Now this is love of country. 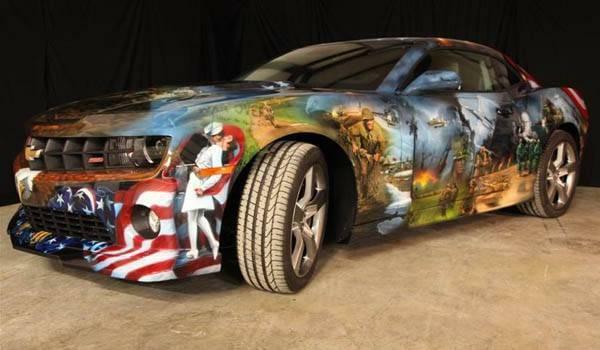 Part historic timeline, part remembrance for our fallen, this paint job far exceeds the realm of “cool paint jobs,” crossing into the plane of great American artwork. But wait, what’s on the front of this stunner? Somewhere, Abraham Lincoln’s ghost just shed a single tear. 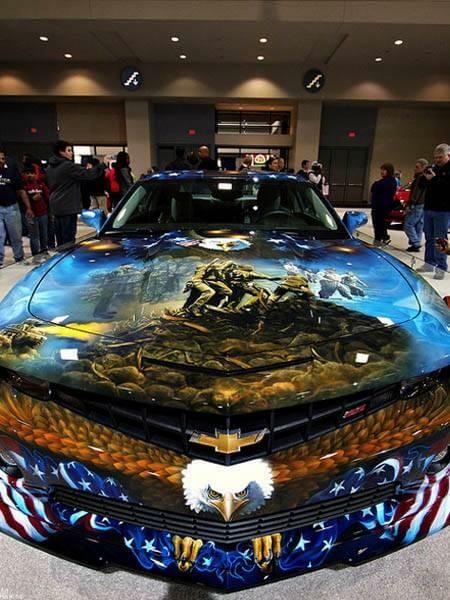 Have you seen any great patriotic paintwork? 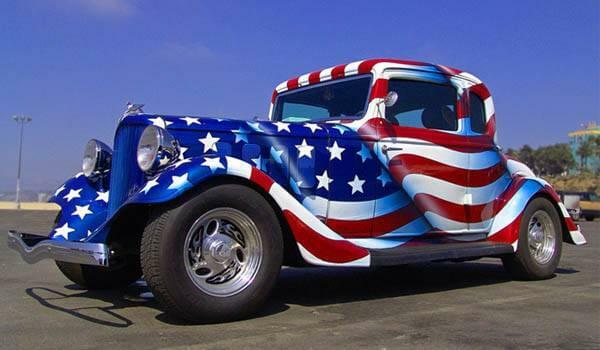 If you’ve come across a great American paint job, be sure to snap a pic and show us!